This livens up just about everything from breakfast sausages to stew, curries and leftovers. Great with cold cuts of meat, crackers & cheese. Heat the oil in a pan and add the mustard seeds. Once the seeds start popping, add the onions, chilli, grains of paradise and stir and fry for about 5 minutes, until the onions are soft. Peel and dice the plantain. Add the plantain, dates and figs to the pan, stir, partially cover and simmer for about 10 minutes. Add the remaining ingredients, bring to the boil and simmer for a further 20-25 minutes until the mixture has thickened. 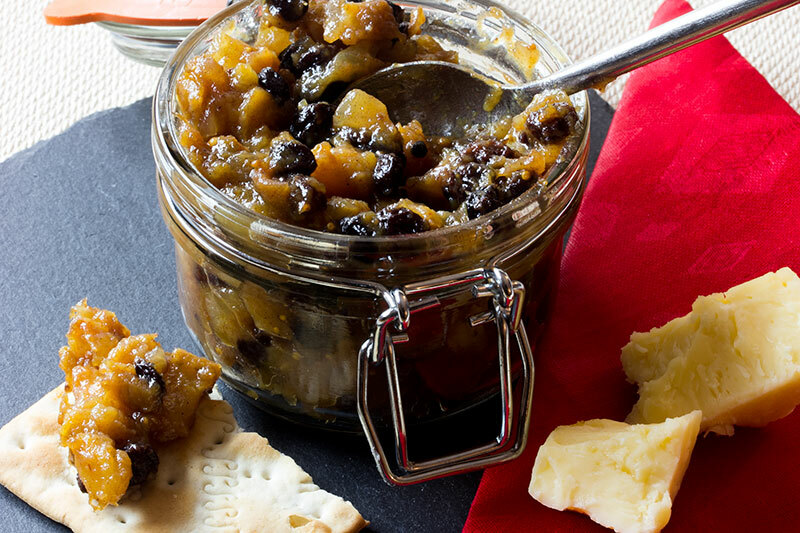 Spoon the chutney into a sterilised jar and leave to cool before sealing and refrigerating. 2 Replies to "Stem Ginger & Plantain Chutney"
How long will this keep? For example, with making Mango Chutneys, they are supposed to ‘keep’ for 3 months before being eaten. Then they are supposed to be refrigerated then six weeks after being eaten. Hi Maggie, I try to keep mine for at least two to three days in the fridge before eating, but it tends to get eaten very quickly after that. The longest I’ve managed to keep it without it being scoffed is 3 weeks!